Hear at Home Mobile Hearing Clinic LTD: When should ear wax be removed? When should ear wax be removed? Under ideal circumstances, a person should never have to clean their ear canals. However, we all know that this isn't always the case and sometimes removal of ear wax is necessary. When wax has accumulated so much that it blocks the ear canal (and interferes with hearing), a physician or hearing healthcare professional may have to wash it out, vacuum it, or remove it with special instruments. Alternatively, a person may be prescribed ear drops that are designed to soften the wax. 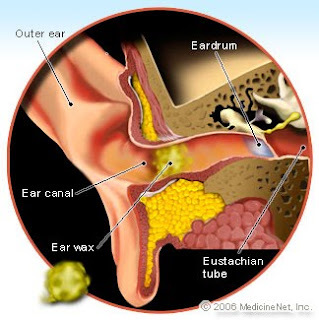 Putting ear wax softeners in the ear in the presence of a perforated eardrum may cause an infection in the middle ear. Similarly, simply washing one's ear in the presence of a perforation may start an infection. If a person is uncertain whether or not he or she has a perforation (hole) in the eardrum, consult a physician or your hearing healthcare professional. Some individuals may also be hypersensitive to products designed to soften ear wax. Therefore, if pain, tenderness or a local skin rash develops, the use of these drops should be discontinued. Never ever try ear candling! Hearing healthcare professionals warn against it as well as Health Canada! Hear at Home is dedicated to providing high quality service and products by qualified hearing aid practitioners. Our service is unique in bringing professional hearing help services right to your door. We believe that by visiting individuals in their own environments we are able to make an assessment of individuals and their “real life listening needs”. We can then provide them with the best hearing advice that suits their lifestyle and budget.